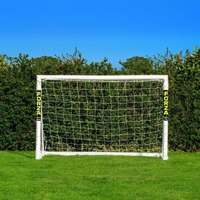 10ft x 6.5ft FORZA Alu80 Futsal Goal made from 80mm reinforced and powder coated aluminum. Regulation size soccer goal for futsal with a UV treated braided goal net, folding side frames and galvanized steel detachable back bars. Red or blue 200mm striped design. 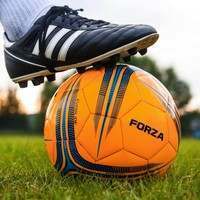 Designed with futsal goal dimensions which conform with the official match regulations, the 10ft x 6.5ft futsal goals are the best futsal goals for any facility who host competitive tournaments and matches. Give your futsal goals a professional finish by choosing between red and white or blue and white 200mm stripes. Made using a 3M fade-resistant material, the indoor futsal goals always remain pristine. Offering a convenient space-saving function to sports centres and clubs alike, the aluminum futsal football goals are designed with quick-release galvanized steel back bars and foldaway side frames. Add professionalism to futsal soccer matches and tournaments with these premium aluminum futsal goals. 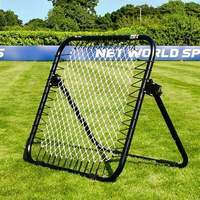 Designed to the regulation futsal goal dimensions of 10ft x 6.5ft, the heavy-duty futsal goal posts are perfect for competitive games on indoor or outdoor pitches as well as being a quality option for sports centres and schools. 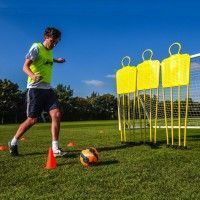 The pop-up futsal goals are both convenient and professional, making them the best futsal goals for coaches at all levels of the revolutionary small-sided version of soccer. 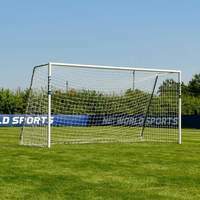 The metal futsal goal posts have been made using heavy-duty square reinforced 80mm aluminum, which is capable of withstanding countless impacts with the ball. 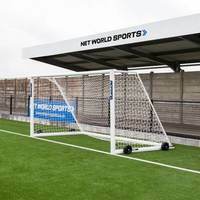 Suitable for use as indoor futsal goals, the sleek white powder coating also protects the goal posts from corrosion when used on outdoor futsal pitches. 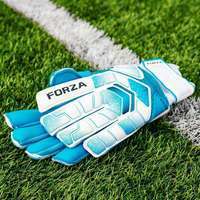 Heavy-duty and highly durable, the futsal goals can be applied to both training and competitive sessions without becoming damaged by wear and tear. 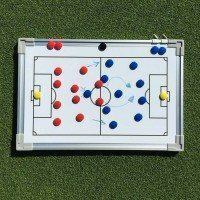 There are two colored futsal goal designs to choose from, with 200mm red/white and blue/white stripes on offer. 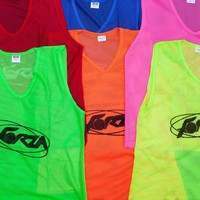 These striking colors have been created using fade-resistant materials, ensuring that the brightness and lustre of the futsal goals won’t diminish over time. 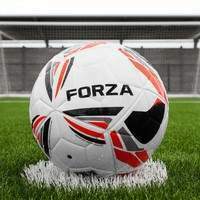 The best futsal goals for long-lasting use, the durability of the futsal soccer goal posts guarantee consistent performance over the course of multiple years. 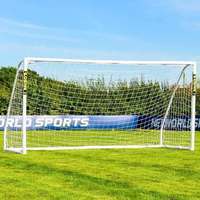 A professional quality white 3mm HDPE futsal soccer goal net joins the aluminum futsal goal posts to result in the ultimate futsal goal package. 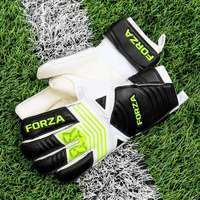 The UV stabilized nets are fully weatherproof, and provide equal amounts of protection against sunlight and rain, ensuring that you can play futsal outdoors as well as indoors all year round. 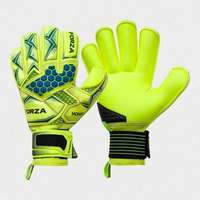 For shock and impact absorption, the soccer nets have a baffle net which is securely held by a top support bar for supreme stability. 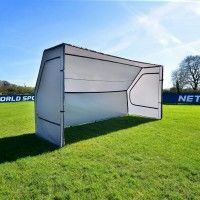 Featuring heavy-duty galvanized steel foldaway side frames, the futsal goals provide a convenient space-saving function to sports centre, coaches and clubs. 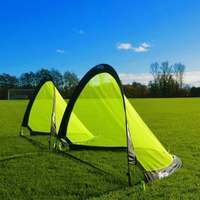 The pop up futsal goals can be collapsed and folded away after use, ensuring that the goal posts won’t take up all the room in your storage areas. 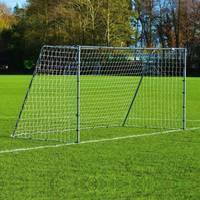 Manufactured with ultra-strong welded corner joints, the portable futsal goals further guarantee exceptional durability which cannot be matched by mitred joints. 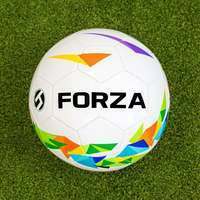 PLEASE NOTE - The FORZA Alu80 Futsal Soccer Goals conform the BS EN 749 safety standards when anchored correctly. 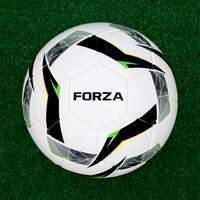 Net World Sports is the best place to buy futsal goals and a wide array of training and matchday equipment for small-sided soccer from our game-changing FORZA soccer range.